Three characteristic canal houses as attractive tea light holders. Made of gold colored metal with punched out windows, that make the tea lights spread their warm candlelight. A design of Studio PP, the own design studio of Pols Potten. Three tea lights included - ready to use. What are you waiting for? The Netherlands has a rich history, in which the golden age has played an important role. At that time, Netherlands was the epicenter of world trade and the cities grew immensely. The canals in the large cities were essential for the transport of goods and the Dutch export. Beautiful houses and warehouses were built along the canals. These houses often had special facades, facades that still can be seen in Dutch cities and that are and typical of Dutch culture. These tea light holders of Pols Potten bring this Dutch culture a little closer. 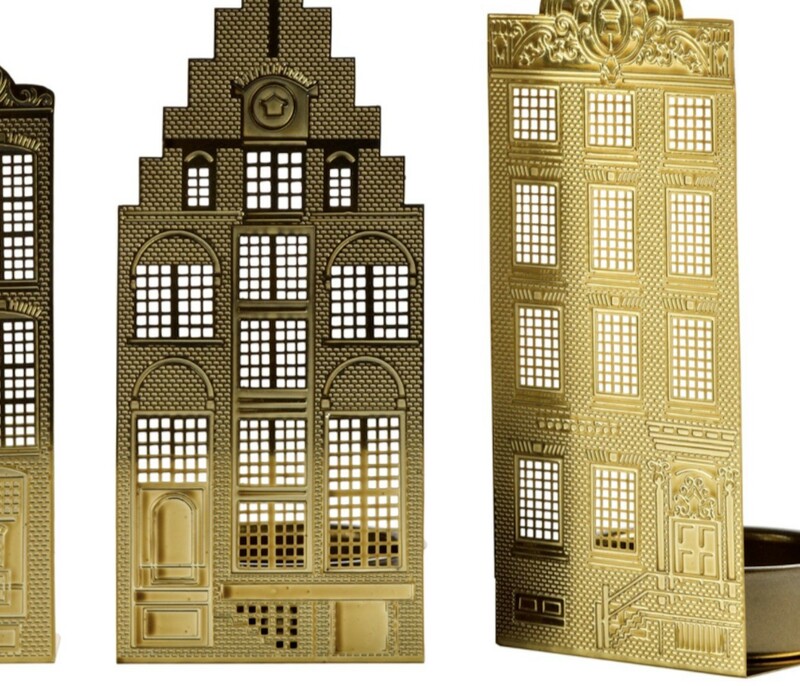 The tea light holders are made of gold colored metal in which bricks and façade decorations and where the windows are punched out. Light shines through the windows when you place a burning tea light behind them. There are three different canal houses: a semicircle gable, a neck gable, and a stepped gable. Very attractive as a set of three. Delivered to you in a gift box including 3 tea lights. 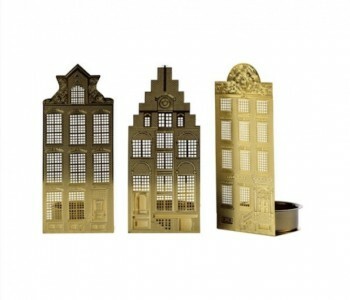 Create a warm atmosphere with this set of 3 tea light holders canal houses of Pols Potten.